Jeweled shoes from the 1700s. Fragile dresses from the 1800s. Avant Garde designer clothing from the 1900s. These are just a few of the historic garments now viewable in never-before-seen photographs on a new searchable website created by Houston Community College with a $25,000 grant from the Texas State Libraries and Archive Commission. The digitizing project called Texas Treasures - a first for HCC - involved far more than taking simple, straight-on photographs. Different angles and perspectives as well as extreme details of 220 of the most significant items in the 6,000-piece archive were captured using state-of-the-art, high definition photographic methods, making the collection highly useful to fashion students and the public. The HCC Historical Fashion Archive began in 1988 under the direction of Kay King, the former, long-time chair of the HCC Fashion Department. It is divided into two sections: The Historical Costume Collection and the National Dress Collection. The Historical Costume Collection is largely comprised of 4,000 pieces donated in 2009 by the late Elizabeth S. Brown, one of the founding members of the Costume Society of America and a nationally known fashion historian. This collection is comprised of dresses, menswear, outerwear, undergarments, shoes, and handbags handmade by couturiers, dressmakers, artisans and homemakers. Three significant pieces - a 1760s men’s embroidered linen waistcoat, a 1950s Charles James “cloverleaf” gown, and a 1990s Chanel Couture dress and jacket ensemble - provide excellent examples of design, apparel construction and textiles. The National Dress Collection includes debutante gowns, military uniforms, wedding gowns and other formal, special-occasion costumes, many with ornamental details. A substantial number of garments in this collection have been worn by Texas debutants and international socialites, including Lynn Wyatt, Julia Frankel and Carol Isaak Bardon. Other contemporary pieces in the collection have been designed by Texas-based fashion designers, such as Reza Khan, Chloe Dao, Ruby Marquez, Ken Simmons, Myrtle Moore, Paul Peacock, Viet Kent Nguyen, Vi Hua and Victor Costa. Excessive handling over the years has damaged many of the fragile, historic garments and dresses in the 30-year-old collection. Therefore, access has been restricted to HCC faculty for the past two years for preservation purposes. 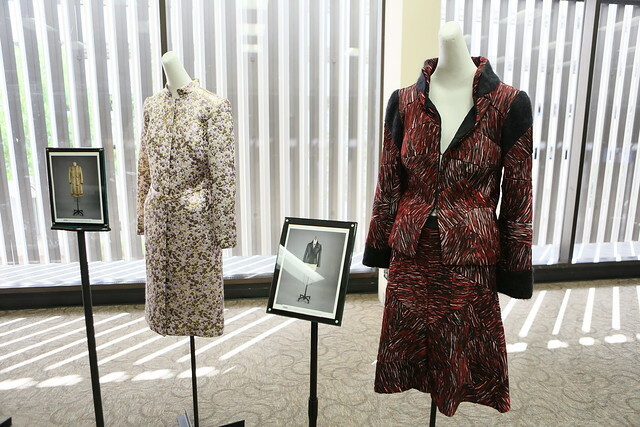 The HCC Historical Fashion Archive is housed in a 1,200 square-foot room at the college’s Fannin Street building. Eventually, HCC envisions starting a campaign to construct a larger, museum-quality facility to house and showcase the collection. The website is accessible here.